I've been using this sample since August and I'm not even at the half way mark. First, let me apologize for not having the regular size bottle of the Shu Uemura Skin Purifier High Performance Balancing Cleansing Oil Enriched. I had finished my full size bottle back in August (before starting So Lonely in Gorgeous). So, since I had a sample of it (a gift with purchase back in July), I wanted to use the generous sized sample up before I repurchased another bottle. 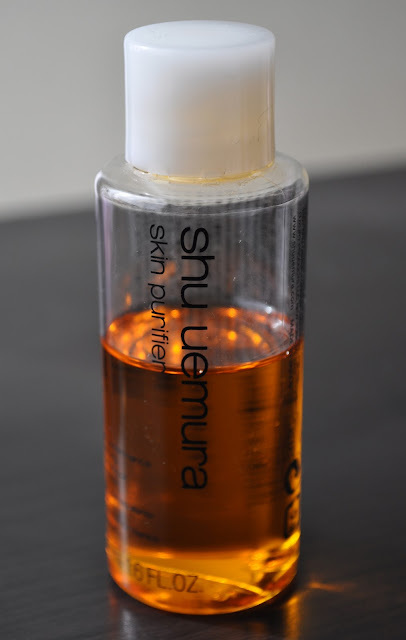 Shu Uemura's Skin Purifier High Performance Balancing Cleansing Oil Enriched (wow, that's more than a mouth full) is one of my sacred facial cleansers, especially during Winter. I have normal to dry skin but during the colder seasons my skin can get as dry as a thanksgiving turkey. Shu Uemura's cleansing oils are formulated with various botanical extracts that leave the skin clean, moisturized ans supple. This Cleansing oil feels like liquid silk and rinses off completely without leaving any residue or clogging pores. Shu Uemura (the brand, not Uemura san himself :P) recommends to massage 3 to 4 pumps onto dry skin, add water for emulsification (emulsification is when water mixes with the oil, turning it a cloudy white), then rinse. In the mornings, I apply four pumps (two is more than enough but I love to slather it on) onto my dry face; massaging the oil into the skin in small circular motions, Then, I dampen my hands with warm water and continue to massage my face emulsifying the product; then, rinse with cold water. In the evenings, I use the oil cleanser as more of a makeup remover, followed by another cleanser. Even though this cleanser does a great job of removing makeup, I'm just a little OCD when it comes to washing my face...come to think about it, I'm a LITTLE OCD on a lot of things :P So, in the evenings, I apply two pumps onto my face removing my makeup. Then, I use another two pumps to remove my eye makeup. Emulsify the product, rinse and follow up with another cleanser. Shu Uemura offer several different cleansing oils geared towards every skin type; Fresh Pore Clarifying Gentle Cleansing Oil (pink oil) for combination to oil skin, High Performance Balancing Cleansing Oil Advanced formula (pale yellow oil) for all skin types, Skin Purifier High Performance Balancing Cleansing Oil Enriched (orange oil) for dry skin, Cleansing Beauty Oil Premium a/i (yellow oil) for dry to sensitive skin, Cleansing Beauty Oil Premium a/o Advanced Formula (green oil) for mature skin, and finally, White Recovery Brightening Cleansing Oil Advanced Formula (lavender oil) for Brightening. Skin Purifier High Performance Balancing Cleansing Oil Enriched retails for 2,940 yen ($38.23) for 150mL and 7,875 yen ($102.39) for 450mL. The enriched cleansing oil is only available at Shu Uermura counters (but I'm sure you can find it on the web). A hefty chunk of change for an oil cleanser but this product with last you for some time and skin care is something you should invest in. The Skin Purifier High Performance Balancing Cleansing Oil Enriched is a multi-tasking cleansing dynamo that removed makeup, cleanses and moisturizes. This is one product I can guarantee that I will never be without!! Have you tried any of the Shu Cleansing Oils?